Intact culture and livelier traditions of Bhutan plays an important role in attracting tourists from all over the world. The magical Himalayan kingdom of Bhutan is proud of its origin, religion and cultural quirks. Bhutan celebrates cultural events and festivals throughout the year, which signifies the celebration of its long-standing traditions. 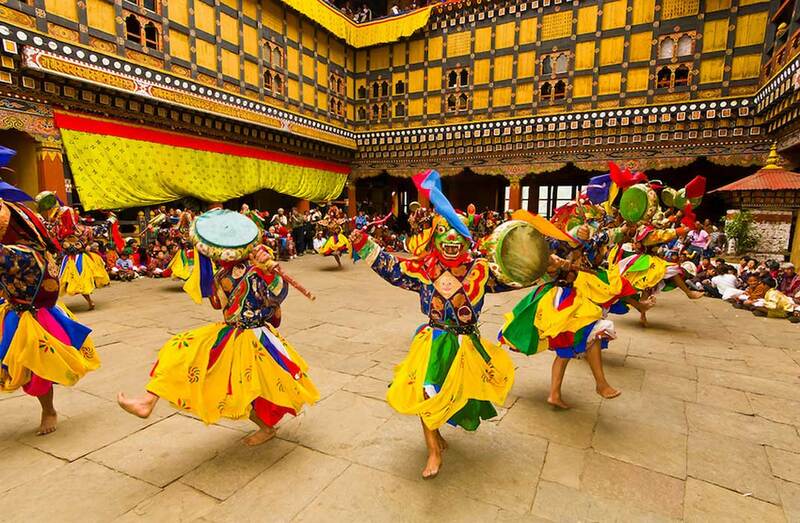 Witnessing Bhutan festivals will help you in experiencing a joyful and colorful atmosphere. The Punakha Drubchen festival is the Bhutanese equivalent of American annual Civil War re-enactment. In this festival one can witness dramatic recreation of scenes from Bhutan’s 17th century battle with Tibetan army. This celebration is for the glorious victory, which brought peace and stability to the country. In this festival one can witness local militia men or pazaps dressed in richly-ornamented battle gear, enacting the battlefield scenes with delightful earnestness. After the Punakha Drubchen, Punakha Tsechu festival is celebrated, which offers the delight of witnessing two stunning festivals back to back. By heading to witness Sakteng Festival, you can see Bhutan at its most untarnished mode. This is a magnificent 3-day festival, which is held by semi-nomadic Brokpa community. The Sakteng Festival is all about celebration and worship that is held in Sakteng Valley of Eastern Bhutan. In this festival, you will get to see plenty of traditional clothing as well as find local drink or wine-ara, and enjoy number of traditional dances like Ache Lhamo & Yak dance performed by Brokpas. Haa Summer Festival in Bhutan is all about letting your hair down. This festival is set amidst a stunning Bhutanese wilderness that makes connects with Bhutanese culture, sports and cuisine. In this festival, you as a visitor can indulge in local sports like yak riding or enjoy tribal folk songs. The meaning of Tsechu is ten days. This festival is held throughout Bhutan every year to pay homage to Guru Rinpoche (Padmasambhava). Guru Rinpoche introduced tantric form of Buddhism to the country in 8th century. In Thimpu, Tsechu is celebrated with great aplomb over the course of 3 days, during which thousands of people across Bhutan and all over the world flock to the capital for witnessing this amazing festival. This festival takes place in the courtyard of the Tashichho Dzong. The Tsechu festival involves religious activities and symbolic dances. Remember this festival is considered to be the most anticipated and important festival in Bhutanese calendar, so do not forget to include it while planning a festival tour package from Bhutan Buddha Travellers. We will make sure in planning an exceptional and well guided festival tour as per your requirement and budget that will make your Bhutan trip a memorable one.